New Delhi: Students of the Aligarh Muslim University have denied media reports that they’ve been slapped with sedition charges because of their altercation with a reporter from Republic TV. They insist that the charges are due to ‘anti-national sloganeering’ on campus. On 12 February, a brawl had reportedly broken out between Hindu and Muslim students of the university over a planned programme featuring All India Majlis-e-Ittehadul Muslimeen MP Asaduddin Owaisi. At around the same time, Republic TV reporter Nalini Sharma claimed that she and her crew were heckled and their equipment broken by students and the administration of AMU. While students from both groups say there was “a riot-like situation” in the university and blame the other group for it, they agree that the sedition charges have nothing to do with the alleged incident involving Sharma. Some Hindu students, backed by the Bharatiya Janata Yuva Morcha (BJYM) leaders, were protesting against Owaisi’s event due to his “anti-Hindu ideology”, said Nishit Sharma, a local BJYM leader who had also filed an FIR against AMU students. BJYM is the student wing of the ruling BJP. “We were protesting against Owaisi’s event since he has hurt Hindu sensibilities on several occasions… We were clear, if he comes to campus, we’ll gherao him and not let him leave,” he said. However, former AMU Students’ Union vice-president Sajad Rather alleged that it was the BJYM-backed leaders and students “who were firing guns on campus”. “Our students only went to protest against the firing. The police was called to just calm the situation down and stop violence from erupting, but they used the occasion to slap the protesting students with sedition,” said Rather. “It’s a mockery of the sedition law that you use it against protesting students, and leave the ones who were firing on campus. 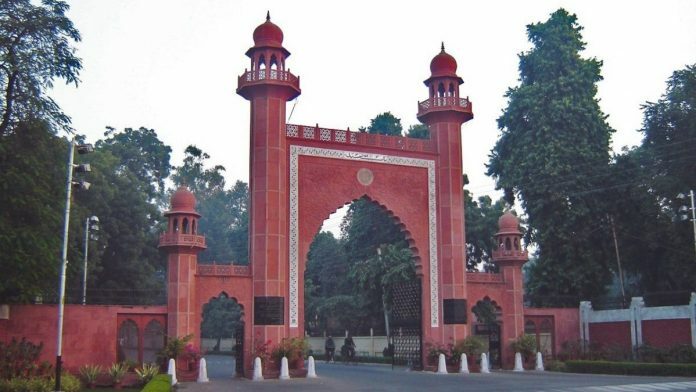 The police’s prompt action against AMU students shows their bias,” he alleged. A BJYM supporter who did not wish to be named clarified that the two incidents took place at around the same time. “So that created this confusion…She was heckled by some students, but that’s not why they have been booked for sedition,” he said.